It’s become Mercy Me’s best known song, but until now, few people knew the full, heartbreaking story behind I Can Only Imagine. Now, in a film by the same title, we learn that the hit song was born out of years of heartache and pain. Hitting Australian screens on Thursday March 15, the film is a heartwarming, poignant and at times comical biopic, sharing the story of the strained relationship between Mercy Me lead singer Bart Millard, and his abusive, troubled father. The movie lets us in on some of the most moving and poignant moments in Millard’s life as a teenager growing up in a broken family, using music (played through his Walkman), as his escape. Both Millard’s character (J Michael Finley), and the real Bart Millard, say that Mr Millard senior (Dennis Quaid) was ‘a monster’ when he was at his worst. 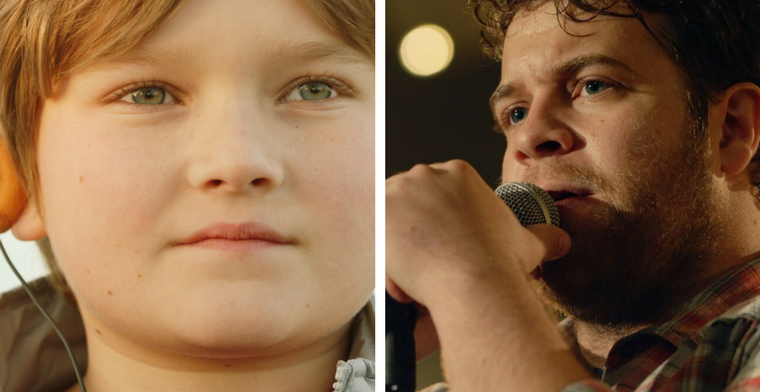 Fine performances: Bart Millard is played by Brody Rose (L) and J Michael Finley. But it’s not all sadness—the film has an overall feeling of hope, as we watch Millard escape his home and hit the road as a hopeful young musician in a fledgling band, and find hope in his growing Christian faith. There’s many comical and touching moments as a young Millard plays early gigs, makes relationship mistakes with his girlfriend, and meets and forms a friendship with manager Scott Brickell. The young musician’s encounters with a younger Michael W Smith and Amy Grant, (not played by themselves) are a lot of fun. The moments that lead to the writing of the hit song take listeners through a mix of emotions—but I won’t spoil it, you’ll have to see the film. In an interview on the DownloadYouthMinistry podcast, Millard says that the movie, which “tries to cram 25 years of my life into an hour and 35 minutes”, is as accurate as it can be. Especially true are the scenes around family violence: “It was important that I didn’t want to embellish them, but I wanted them to be accurate,” Millard said. The one scene that “rips his heart out”, says Millard, is a moment where his father starts to share how he met his mother. It’s touching for the real-life Millard, because he only told movie writers about it in passing. He didn’t expect it to make it into the film. This wonderfully acted film is one for fans of music, biopic fans, and those who love a good story of redemption and transformation. It’ll also give audiences hope for their own strained family relationships. Bart Millard has also release a book of the same title telling his story in his own words.